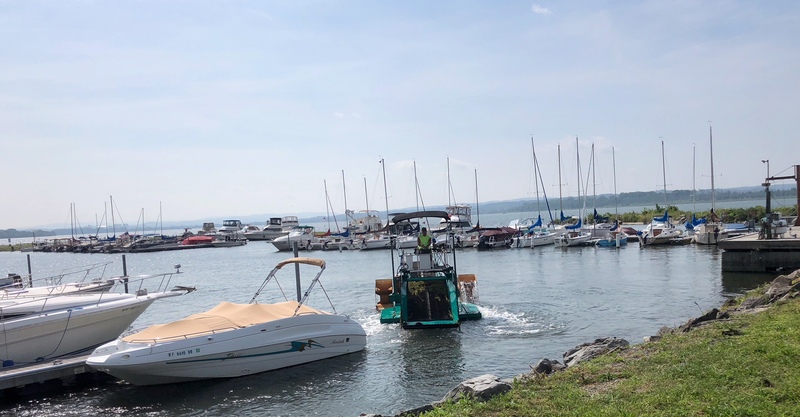 Taking our work break walk from the library recently, we noticed some mining going on in Onondaga Lake. A truck in the Marina announced that the vegetation piling up in the bed was 100 percent natural. I spotted the boat doing the work right in the marina waters. Looks a lot like seaweed to my uneducated eyes. A lake getting its lawn mowed? It does look like it, Scott! What do they do with it MBM? I think they sell it to market, MBC. Helpful all the way around then. Yeah, I’ll leave it to another, Beth. I think we sometimes do not even realize all that goes into water maintenance.